The month long ritual fasting undertaken by Muslims in Ramadan though intermittent in that they abstain from eating and drinking from dawn till dusk only, it is absolute during the span of fasting as they are forbidden from taking anything by mouth be it water, fruits or even oral medications. There are bound to be changes in their life style, sleep hours, physical activities, food consumption, meals frequencies, and dietary habits for different reasons. Proper management of food and fluid intake and exercise activity regulation is essential so that the spiritual fasting of Ramadan becomes an enjoyable experience free from avoidable hardships for all those who are found fit to undertake Ramadan fasting. Controlled studies are required to unravel the mysteries surrounding the complete understanding of the physiological states of satiety, hunger and fasting, and the role of both internal and external factors of orexigenic and anorexogenic nature and the scientific basis of the relative ease with which millions of Muslims the world over are able to observe the month-long Ramadan fast. Celiac disease (CD) is an immune - mediated enteropathy caused by ingestion of gluten present in wheat, barley, and rye in genetically susceptible individuals. It was considered to be a disease of childhood, but now it is reported with an increasing frequency. Classically, it present with intestinal symptoms such as diarrhea. However, in recent studies more patients are diagnosed with extra-intestinal manifestations. A trend towards more extra-intestinal manifestations and diagnosis at later age reported from several countries. In developing countries, CD is a diagnostic dilemma because the histological changes may not be pathognomonic of the disease and several other common conditions such as persistent enteric infections, parasitic infestation, small bowel bacterial overgrowth or tropical sprue have similar mucosal abnormalities. Furthermore, interpretation of mucosal histology in the presence of severe malnutrition where similar changes may be seen is difficult. A highly sensitive and specific test as adjuncts to histology is required in diagnosing celiac disease. Delay in diagnosis may also be there mainly because of lack of awareness about this condition because the symptoms may have been attributed to many other more frequently occurring conditions such as gastrointestinal infections, infestations, and nutritional deficiencies. However, untreated CD may lead to several complications, some of which may be irreversible, so early diagnosis and prompt institution of gluten free diet is important. The Buddhist Lent is an annual three lunar month long fast observed by devout Buddhists. This involves fasting daily from noon to midnight, abstaining from all solid foods. Only liquids and jaggery are allowed during this period. This paper discusses the unique nutritional challenges posed by this fast for people with diabetes, and suggests practical recommendations to ensure healthy nutrition and successful fasting for them. Nutrition plays a role of great magnitude in the pathogenesis and progress of endocrine diseases. Traditionally, the nutritional risk factors such as over- and under-nutrition in the context of endocrine diseases have been described alone in their individual capacity. However, the current subject of interest is how these risk factors interact with genetic variations and affect nutritional programming. Also, the role of endocrine disrupter chemicals that are consistently being ingested in routine diet is being evaluated in the causation of current epidemic of endocrine disorders such as diabetes and obesity. The present review aims at highlighting the important nutritional risk factors that have impacts on various endocrine disorders. Background: Oxidative stress associated with hyperglycemia is a key factor in the development of diabetic complications. The organosulfur compounds in garlic have been shown to possess antioxidative, antidiabetic and immunological potency. Probiotics in fermented milk (FM) also enhance antioxidant and hypoglycemic therapy through the modulation of gut microbes in type 2 diabetes. 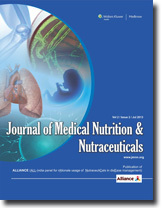 Aim : To examine the effects of administration of garlic supplement, probiotics, and their combination on glycemic, lipid, and antioxidant status in type 2 diabetes. Materials and Methods : Diabetes was induced by STZ-injection in thirty male albino rats. Animals were equally divided to 5 groups: garlic (G) (20 mg/kgBW/Allicin), probiotics (Prob) (0.5 ml/kg/BW), garlic with probiotics (G + Prob), oral hypoglycemic drug (OGD), diabetic control (DM). After 45 days of treatment, tests were conducted for fasting glucose, glycated hemoglobin (GHbA1c), insulin, malondialdehyde (MDA), total antioxidant capacity (TOAC), total cholesterol (TC), LDL-C, HDL-C, and TG. Results: Glucose and GHbA1c were significantly reduced with all treatments. GHbA1c was significantly lower in the G and G + P groups compared to DM and OGD. No significant difference was observed for insulin. 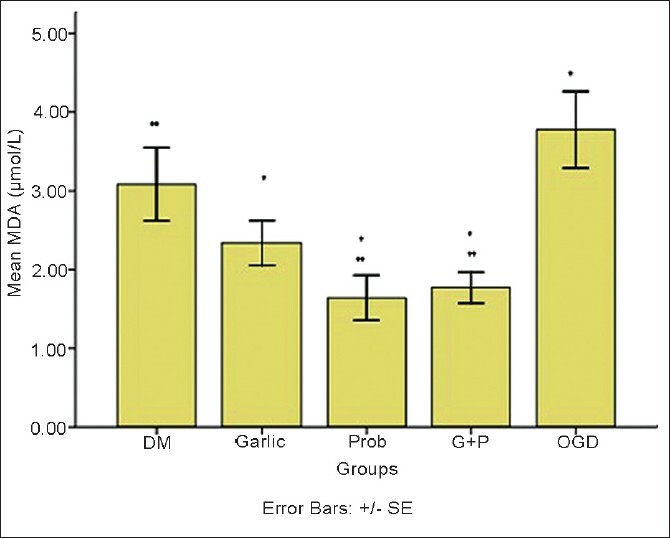 Garlic reduced TC and TG compared to DM, and reduced LDL-C compared to OGD. G + Prob treatment raised LDL-C compared to G, Prob, and OGD groups. HDL-C significantly increased in the P and G + Prob groups compared to DM, OGD, and G groups. MDA decreased with all treatments, while TOAC increased with G and G + P groups compared to DM and OGD. Conclusion: G arlic, or its combination with probiotics might promote beneficial effects in controlling glycemia, dyslipidemia, and oxidative stress. Probiotics was not as efficient as G and G + Prob treatments. Background: The diabetes pandemic puts an unmanageable load on exisiting health care services, especially in resource challenged settings. It is necessary to create simple, easy-to-administer, and easy-to-understand dietary prescriptions which can be explained in a short period of time, by diabetes care providers without formal training in nutrition, to patients . Aim: This study assesses the accuracy and utility of an easy-to-administer diet, termed as the Bharti Hospital, weight ÷ 10, two minute diet. Materials and Methods: This prospective, unicentric, observational study was performed at an endocrine center in Haryana, north India. Two hundred consecutive persons with diabetes were explained a simple diet, with a single page visual aid, by a multipurpose diabetes worker, supervised by the consultant dietician and endocrinologist. Accuracy of the dietary prescription was assessed by calorie and nutrient content, measured by the dietician. Efficiency was measured by the time taken to administer the dietary prescription. Acceptability of the diet therapy was judged as a patient-reported outcome, using a pre-tested structured questionnaire, self-administered by the subject after undergoing nutritional counseling. Efficacy was assessed in all patients who returned at one month for follow-up, using a 24-hour dietary recall questionnaire. Results: Without counting calories from cooking fat/oil, the calorie content of the diet was 17.5 calories/kg/day, with a balanced mix of carbohydrates, proteins, and fat. The times taken to administer this diet ranged from 1.0 to 7.5 minutes (mean average, 3.15 ± 2.46 minutes). Patients rated acceptability of this prescription at 4.1 ± 0.7 on a 5-point Likert scale. Forty patients, followed up at 1 month, reported caloric intake of 24.3 ± 4.51 cals/kg/day. Conclusion: The Bharti Hospital 2 minute weight ÷ 10 diet provides a simple framework upon which a dietary prescription can be based. It provides a fast, yet effective method of explaining dietary management by staff who do not have formal qualification in nutrition, and is acceptable to patients. This diet should be customized and studied in different culinary regions across the world. Background : Vitamin A deficiency is a major cause of preventable blindness in India. Aims, Materials and Methods: This study was initially performed to assess prevalence of vitamin A deficiency in a rural village. After data analysis, extremely low levels of vitamin A deficiency disorder was found lower than national average. To know the exact reasons, the initial prevalence study was converted into pilot study, and another phase was added, which included assessment of the dietary habits of population with food frequency questionnaire. To rule out bias, another control population sample was taken on a random sample basis. Results: The dietary habits of the people showed high intake of mint in the particular area, as that area was a major producer of mint. Conclusion: We conclude from this study that simple changes in diet can lead to significant reduction in disease burden, without adding cost. The Nobel Prize is the pinnacle of success in medical research. An analysis of the Nobel Prize winning discoveries gives an idea of the evolution of modern medical science. This brief communication focuses on the vitamins that made it to the Nobel high table, i.e., the vitamin-related discoveries that won the Prize in Physiology or Medicine, and in Chemistry. The authors trace the history of vitamins at the Nobel Prize, from 1903, when Niels Finsen won the prize for his work on heliotherapy, till date. The discoveries of various researchers are explained, as is their importance.